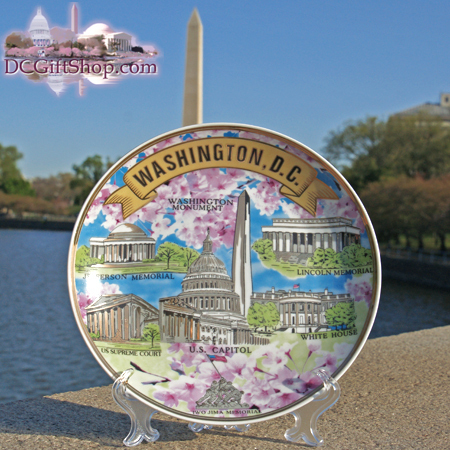 This display plate is a wonderful piece of art and shows many of the major landmarks that made Washington DC such a great tourist destination. Featured are the Jefferson Memorial, the Washington Monument, the Lincoln Memorial, the White House, the Iwo Jima Memorial, the U.S. Capitol Building and the U.S. Supreme Court Building. Washington DC souvenir plates make the perfect gift. All the monuments and buildings are highlighted in 24k gold (see photo) and the background is a blue sky with many blooming cherry blossom flowers and is another thing DC is known for � the 3,750 cherry blossom trees that spring to life late March in West Potomac park. Plate measures 7.8 inches in diameter and is for display and decorative purposes only.